Playing a classic team-building game called the Human Knot, Epicenter staff and a visiting group of foster youth try to untangle their intertwined arms without letting go of their partner’s hand. The Epicenter feels like home when you first walk in, and that’s the way it’s meant to be. A string of wooden letters spelling “Welcome” hangs across the front porch. There are a couple of chairs at the top of the stairs. A clip by the front door holds the mail. A youth-led, youth-operated organization, the center is modeled on successful programs for at-risk youth in Sonoma and Napa counties. It opened in Salinas in the fall of 2014. Right from the beginning, young people wanted the center to embody open doors and a positive attitude, offering easy access to resources and advice about wellness, education, housing, and employment. Centrally located in downtown Salinas on Maple Street, within sight of Salinas High School, The Epicenter was originally brought to life as a partnership between Monterey County Child Welfare Services and Voice Our Independent Choices for Emancipation Support (VOICES). “You know, we work with all ranges, whether it’s foster, probation or not, [youth who face risks] or not,” says Summer Rae Worsham, 22, who became a youth advocate at The Epicenter in 2015. Miranda Mossey, 23, is a program coordinator and youth advocate at The Epicenter. She runs the Our Gente program, which works to provide LGBTQ youth with a supportive environment. 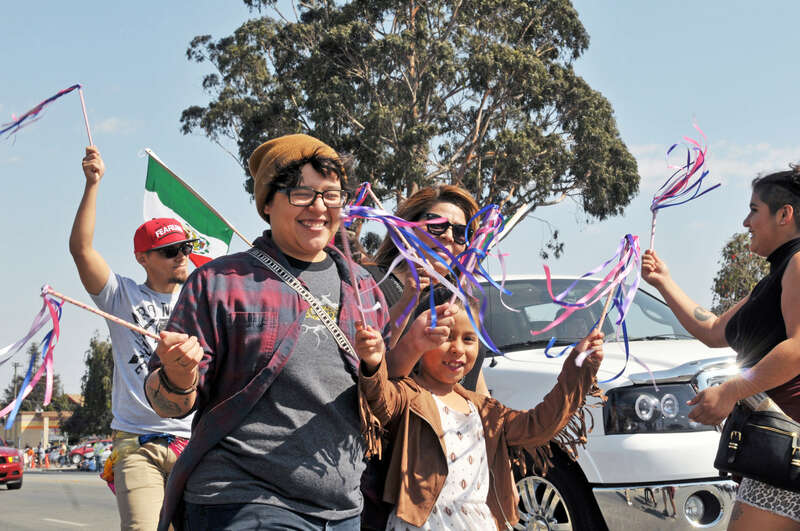 With members of other community groups, Miranda Mossey of The Epicenter marches in support of LGBTQ rights at the 2016 El Grito Parade in east Salinas. 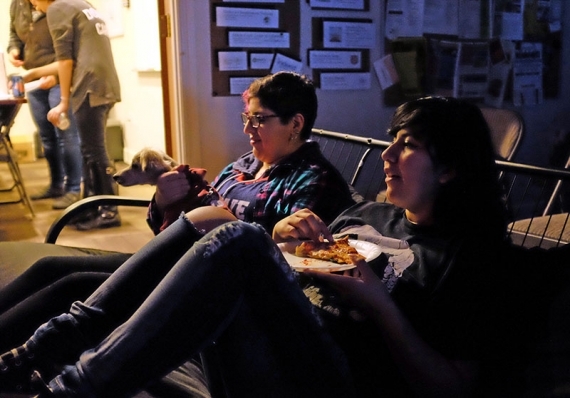 It’s Movie Night at The Epicenter, and inside, a diverse group of youth makes themselves at home. In the kitchen, two friends are making popcorn for everyone. The hallway towards the back of the center has a blackboard surface, and someone is busy drawing with big pieces of chalk, as others laugh and pitch in. The film, Short Term 12, is a sobering choice, starring Brie Larson in a singular performance as Grace, a group-home employee only a few years older than the teens she mentors. Keeping her own pain barely under wraps, Grace gives to her young charges until she bursts. After the film, Summer Rae and Miranda lead a guided discussion, and it quickly becomes clear that some of the youth here are painfully familiar with transitions. The discussion is robust, and by the end of the night, the young people leave with smiles on their faces and positive attitudes. According to an Epicenter handout, Monterey County staff estimated nearly 1,500 youth, ages 16-24, are served each year by the foster, mental health and probation systems. The majority of these youth are Latino, come from low-income families, and live in Salinas. One of these youth, William Mendez, was just 17 when he became one of the original eight founders of The Epicenter. “Growing up in Salinas as a foster youth, there wasn’t really anywhere that I could go and feel safe.”–William Mendez, one of eight original founders of The Epicenter. There are a number of programs, workshops and activities, supplemented by co-located staff, employees of other agencies that provide their services at the center. Kids are free to come in and use the computers, check out postings on the resource wall, talk with staff members or just hang out. All are welcome. Partnerships with almost twenty local organizations ensure that if any question goes unanswered, someone with expertise will be close at hand. Youth relax together before Movie Night at The Epicenter in Salinas. A variety of partnerships help the center carry out its mission. In consultation with the Monterey County Probation Department and probation officers and social workers from a range of government agencies, the center’s My Life Conferences (MLCs) help youth establish goals, with a focus on how to achieve them and become independent. The same team, working with Hartnell Community College, also offers an Independent Living Program (ILP), which helps youth learn to be self-sufficient before they leave the foster care system. Through the center’s Queer and Trans Youth Collective, with advice from the Department of Behavioral Health, Our Gente provides monthly LGBTQ support groups and training for service providers ages 16-24. The center also offers safe space, and is known for inclusive community events. Knowing how important community relationships are, The Epicenter’s Youth Council promotes leadership skills in its members as they organize events and represent the organization. She just returned, exhilarated, from participating in a California Youth Connection session, where youth leaders are able to share their voices with policymakers directly. All eight youth founders have themselves transitioned, both upwards within the center, and onwards–to college or university, to local nonprofits, and to community organizations. In the front office of The Epicenter in Salinas, staff members Samantha Gomez, left, and Summer Rae Worsham prepare materials for a workshop. On the wall behind them are photographs of the original youth founders. For more information about The Epicenter, please visit epicentermonterey.org.